We’d love your help. 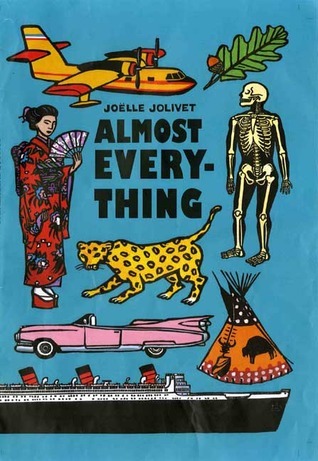 Let us know what’s wrong with this preview of Almost Everything by Joëlle Jolivet. Jolivet, J. (2005). Almost Everything. New Milford, CT: Roaring Brook Press. Engberg, G. (2005, November 1). [Review of the book Almost Everything]. Booklist 102(5). Description: This book is arranged according to theme, describing objects around the world in categories such as trees, the human body, tools, transportation, and historical costumes. Relevance and Relationship: The cost of this book is around $20. Younger students can learn about many different things around the world in a visually stimulating way. Purpose: This book is arranged much like an encyclopedia reference arranged by category. The details and bold designs will capture student interest. This reference can be used by both students and teachers for storytelling and vocabulary work. The end includes columns of additional facts about the featured pictures in the book. Validity: This item has received fairly consistent reviews. It is thorough and detailed and covers a wide range of topics and information. It is accurate in its depictions and has an extensive scope of material for the price. Format: Jumbo-scale print with illustrations. Arrangement and Presentation: User-friendly and visually stunning reference organized by category. Diversity: For younger elementary students. Helps visual learners increase their vocabulary and language skills. The format is appealing and well-organized. It contains information about topics from around the world. There's a drawing of Toraja house in this book. Overall, this is a fun colorful book.